Noel Shaffer '30 and his wife, Ann, never believed "in a hundred years" that they would see their lifetime payments from a charitable remainder unitrust benefitting Ashland University and several other charities, last so long. Although Ann passed away in June, 2009, Noel will soon be 104. 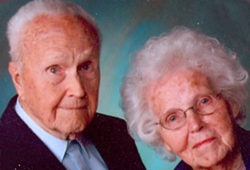 Noel and Ann were married for nearly 75 years. Noel taught chemistry for many years at Ohio High School in Loudonville before transferring his teaching skills to Ashland University, where he encountered a number of former high school students in the same subject. Noel and Ann were always closely involved with their family and church, and were in support of education, the local Lions and Garden Clubs, the library and community ventures at large. They could be seen walking throughout the town, swimming regularly at the local pool and generally keeping fit throughout their lives.